Andy Warhol. Self-portrait in Fright Wig. 1986. Andy Warhol. Debbie Harry. 1980. Andy Warhol. Dennis Hopper. 1977. Andy Warhol. Yoko Ono. 1971. Andy Warhol. Giorgio Armani. 1981. Andy Warhol. Jerry Hall. 1984. Andy Warhol. Princess Caroline of Monaco. 1983. Andy Warhol. Robert Mapplethorpe. 1983. Yuji Obata. Homage to Wilson A. Bentley #11. 2005-2006. Yuji Obata. Homage to Wilson A. Bentley #1. 2005-2006. Yuji Obata. Homage to Wilson A. Bentley #7. 2005-2006. Yuji Obata. Homage to Wilson A. Bentley #9. 2005-2006. Yuji Obata. Homage to Wilson A. Bentley #10. 2005-2006. Paul Fusco. Untitled from RFK Funeral Train (family in descending order). 1968/printed in 2010. Robert Frank. Paris. New Year, 1949. (Man with Tulip). Robert Frank. Rodeo, Detroit. 1952. 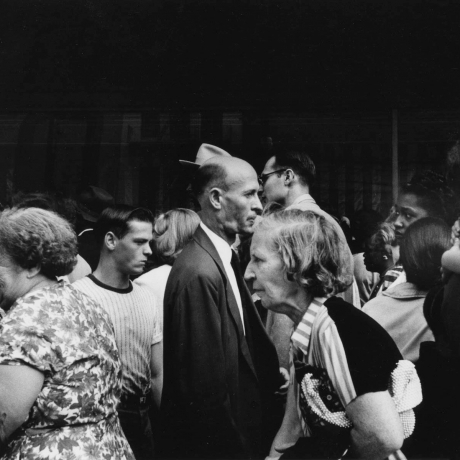 Robert Frank. City Fathers. Hoboken, NJ. 1955. Robert Frank. Coney Island. 1955 (vintage print). Robert Frank. Paris, 1951. (Monument in Snow). Robert Frank. Belle Isle. Detroit, 1955. Robert Frank. London (bankers). 1951 (vintage print). George Tice. Petit's Mobil Station, Cherry Hill, NJ. 1974. Hendrik Kerstens. Pimp Up Louis. February 2006. Hendrik Kerstens, Red Rabbit II, February 2009. The Sartorialist (Scott Schuman). Emmanuelle Alt. The Sartorialist (Scott Schuman.) Carine Roitfeld. The Sartorialist (Scott Schuman). Untitled. 2011. Chris Shaw. Keep at Arm's Length (self-portrait). 2006. Chris Shaw. Sky at Night. 2006. Chris Shaw. The Night Porter and his Higher Power... 2006. Tereza Vlckova. A Perfect Day...Elise. 2007. Adam Fuss. Fiddlehead Fern. 1995. Costa Manos. New York City. 1961. Seydou Keita. Three Young Men from Mali. c.1954/printed 1996. Bruce Weber. Bruce and Talisa on my Chriscraft. Bellport, NY 1982. Bruce Weber. Liz, Upper Saranac Lake, New York. 1983. Edward Steichen. Heavy Roses, France. 1914. Edward Steichen. Vogue Fashion Evening Gown. 1930. Edward Steichen. Vogue Fashion Evening Gowns. 1930. Edward Steichen. Isadora Duncan at the Columns of the Parthenon, Athens. 1921. Mario Sorrenti. Kate Moss. 1993. Glen Luchford. Kate Moss. 1994. Terry Richardson. Kate Moss. 1997. Bruce Weber. Kate Moss. 1997. Annie Leibovitz. Kate Moss. 1999. Juergan Teller. Kate Moss. 2000. Chuck Close. Kate Moss. 2005. David Sims. Kate Moss. 2006. Inez Van Lamsweerde & Vindooh Matadin. Kate Moss. 2007. Mario Testino. Kate Moss. 2008. Mert & Marcus. Kate Moss. 2008. Danziger Gallery is pleased to announce our participation in Paris Photo, 2011. We hope you will be able to visit our booth # B20 at The Grand Palais. Wednesday, November 9 - Sunday, November 13.